if an IPA drinker dare drink IPAs? And the answer appears to be 24, because that how many IPAs were served up at the Virginia IPA Challenge last Saturday at Capital Ale House in Harrisonburg, Va. It was originally going to be 28 IPAs, but apparently IPA drinkers can’t chuck that many. 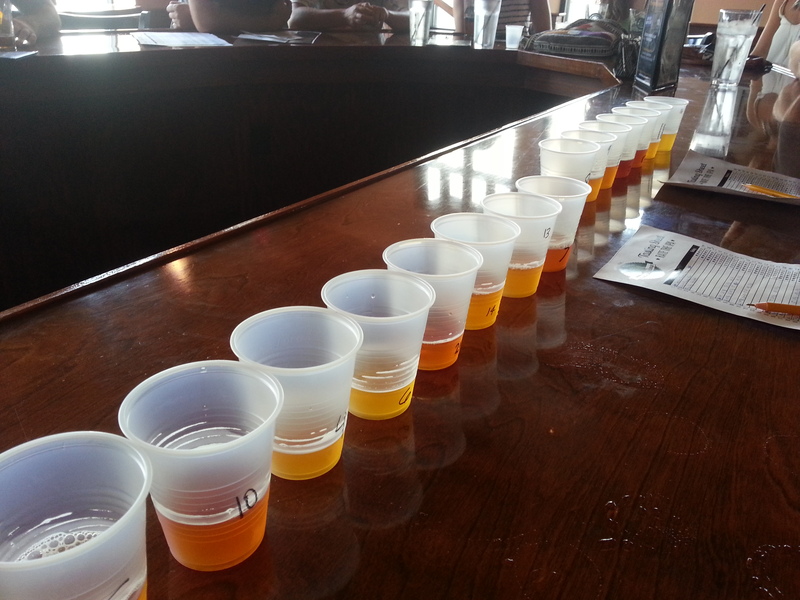 Besides, if my designated drinker is any evidence, 24 IPAs was enough to taste. 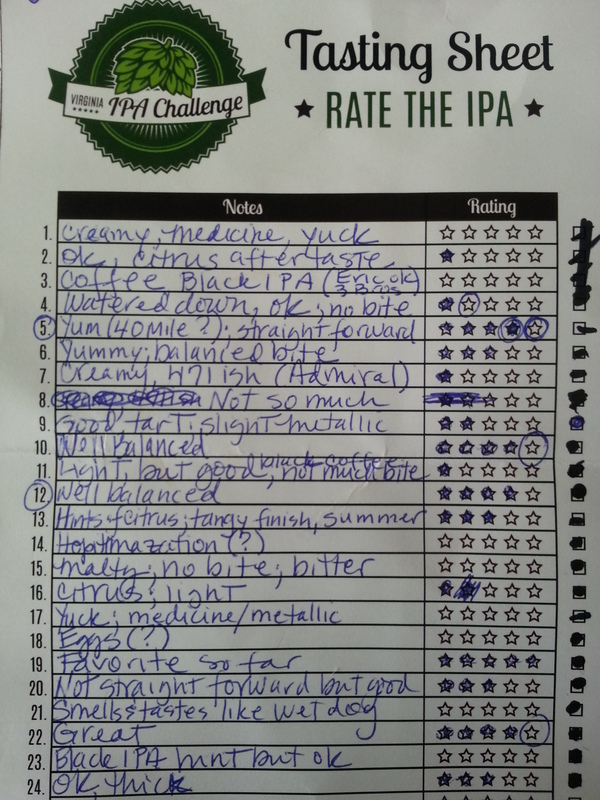 What a rating sheet looks like after tasting 24 IPAs. The way Cap Ale had the contest orchestrated was cool. Each IPA chucker who wanted to get in on the tasting paid $10 for a card that had numbers 1-24 in a column on the left side. Next to each number was a line for drinkers to write any comments they wanted to make about each different beer, and presumably to help them remember what they’d tasted as the day wore on. 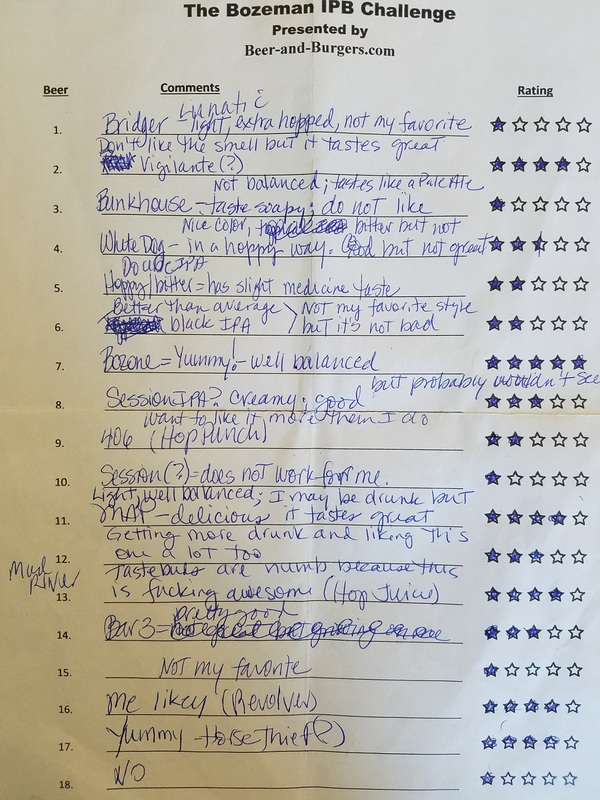 To the right of each line was a place to rate the beer from 1-5 stars. And finally, at the far right was a box to mark off so each drinker, and more importantly our heroic bartenders, could keep track of which IPAs each person had already tried. 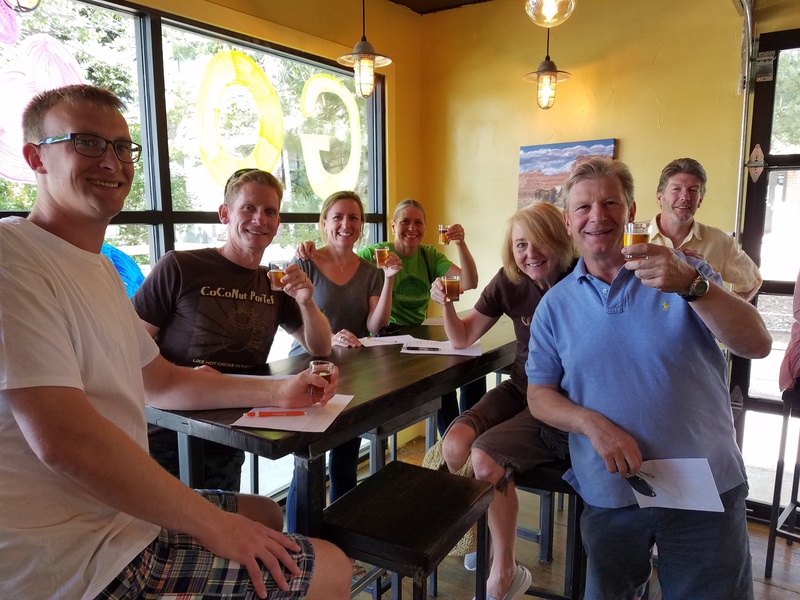 Participants got to sample four beers every time they went to the bar, which meant six trips to the bar. Each small taste – and thankfully that’s all they were, small tastes – was poured in a small plastic cup with a number on the front. So no one knew which brewer had entered which beer. Even representatives from the breweries in attendance didn’t know which numbers were theirs. As I mentioned, I had a designated drinker with me. That’s because, as many of you know, I prefer the more malty side of the beer spectrum. Or, as my IPA swilling friend told someone after trip number five to the bar, “he perfers ports and stouters.” Uh, that would be stouts and porters. IPA drinking pros Alex and Mike show the amateurs how to do it. More and more people showed up as the day went along. The lines got long, but seemed to move at a reasonable clip – at least from my vantage point at a table in the back where I sipped on an Ellie’s Brown Ale from Avery, and later a Lagunitas Cappuccino Stout. And when the lines got really long, people didn’t complain too much because by then they’d already made 3-4 trips to the bar. There’s nothing like downing two dozen IPAs to make people hoppy. 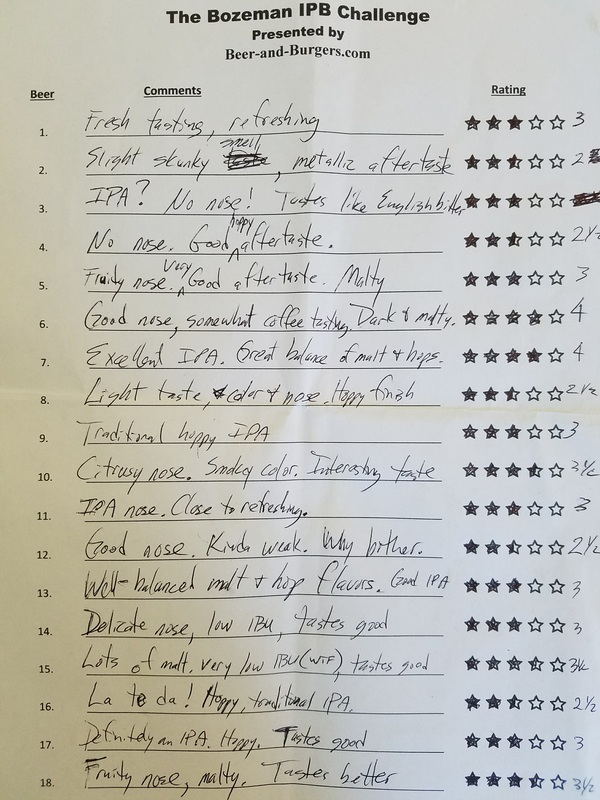 Oh, and after tasting 24 IPAs, each chucker placed their vote for best Virginia IPA and then got a full pint of their favorite. Not a bad dessert. I can’t contributed to the discussion on differences and qualities of the IPAs since I was enjoying my ports and stouters, but my designated drinker wrote down that Isley’s beer was “coffee,” that Three Brothers’ was “creamy” and the Three Notch’d was “yum.” So there’s the expert’s opinion. Regardless of your beer style preference, the Virginia IPA Challenge was a blast. Shout out to D.J. at Cap Ale House for picking the excellent beers, and his fellow bartenders upstairs for working hard to make the lines move fast and keeping everyone hoppy. And a special shout out to Denise who worked the downstairs bar by herself early in the day as the IPA crowd was starting to swell, and for keeping everybody happy. Of course, now I’m expecting a Winter and Christmas Virginia beer challenge in December. How’s that sound, D.J.? 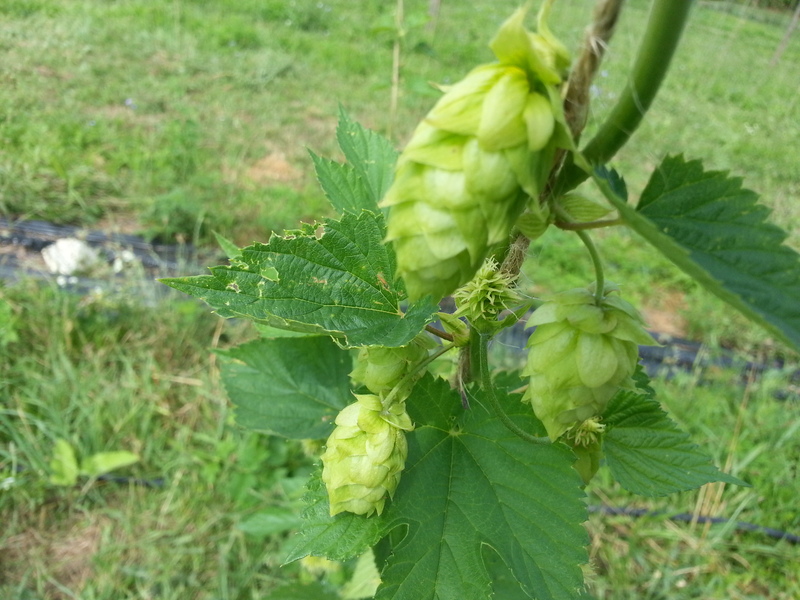 This entry was posted in Beer related and tagged beer, Capital Ale House, craft beer, craft breweries, hop, hoppy, hops, IPA, Virginia. I’m as Hoppy as Pharrell. Or not. When you’re hoppy and you know it, clap your hands. When you’re hoppy and you know it … clap your hands. When you’re hoppy and you know it, then your IPA will show it. The reality is, unlike Pharrell Williams, I am not a hoppy person. I am malty. My preference in beer will always tilt toward porter and stout, and away from those overly-hopped IPAs that make my tongue feel like it needs to be mowed after just a few sips. OK, maybe that’s a little hopperbole. And it’s just one man’s hopinion. But you get my point. But … I certainly understand the value of the hop in the beer-making process. Without it, beer would not be beer. After all, hops are one of the three ingredients allowed in beer according to the Reinheitsgebot, aka the German purity law. Therefore, when presented with the hopportunity to help out a local farming family with their new hop yard, I was hoptimistic. So last Saturday we went to visit Jane, Jason and Juli-Anna. Our mission? To find the leaders (or “bines”) of the hop plants and attach them to a string that we tied to an overhead wire and anchored in the ground next to the plant. Motivated by the thought that these flowers would someday fulfill their destiny in a kettle of boiling water that would hoptimately become beer, we put in a hoptimum effort. Two hours and two rows later, our task was well hopsecuted. So much so, that Jane invited us back for the fall when it’s time to pick the hops. Who could be hopposed to that? 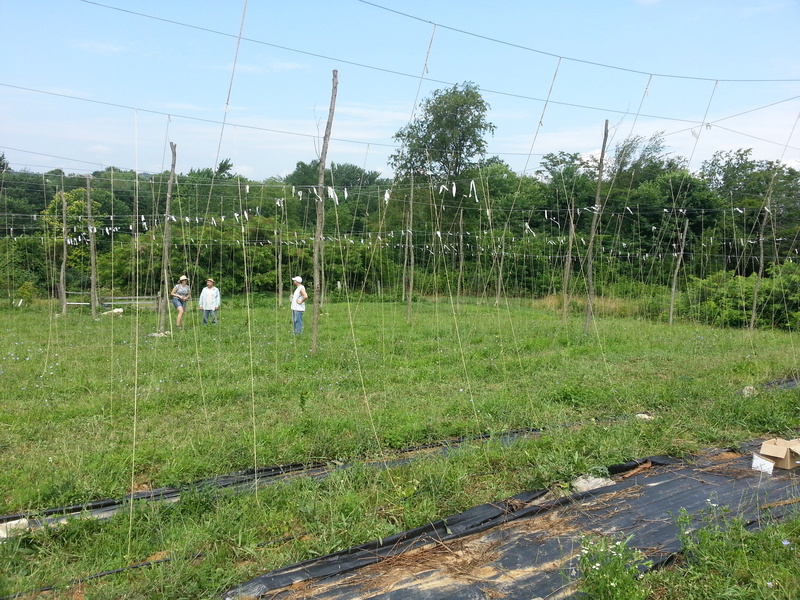 The hop yard at the halfway point. 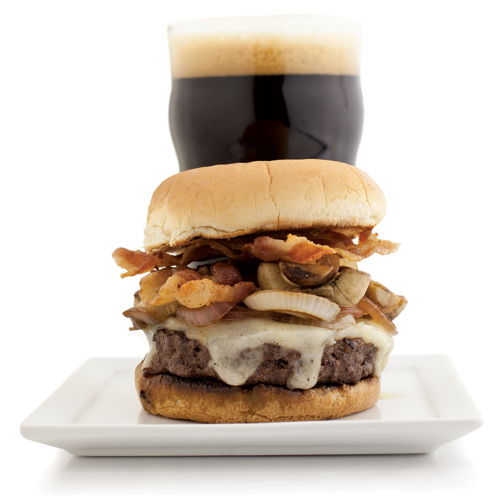 This entry was posted in Beer related and tagged hop, hoppy, hops.